Come enjoy our big garden with plenty of space to enjoy a drink, play french \'petanque\', tennis table or pool or just take a sunbath on our 500m2 wooden terrace! 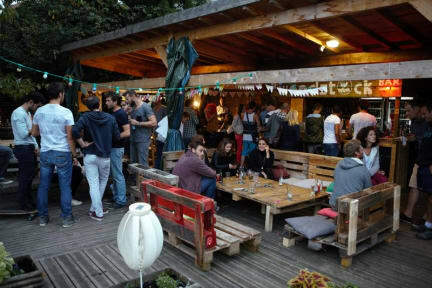 You'll get 10 % OFF on drinks and food at our bar the famous Woodstock Garden ! Because we are also travelers, we know what you can ask from a hostel, it\'s why we have no curfew and no age limit! If you need anything in our hostel, just ask, we'll be pleased to help you! Annecy is a old city with one of the purest lake of Europe, surrounded by mountains that offers plenty of activities. We have partnership with outdoors compagnies so you'll get discount on bikes rental, paragliding, canyoning, kayaking and so much more ! You can also enjoy the old town which is surnamed the 'Venice of the Alps' and by night, discover all the restaurants and pubs the city has to offer! - 1 hour from world class ski resort like Les 3 Vallées and Chamonix. You can of course count on our staff who's from Annecy and will be happy to share their tips with you! Reception open at 9:00am. In SUMMER ONLY, Check-in is at 2pm (as the rooms are being cleaned) but of course you're welcome to leave your bags with us until then, chill out & have a drink! Between October and April you have to confirm your arrival time by email. Reception is only open for guest arrival. If you did not confirm, you will have to wait outside until reception opens. Reception close at 11pm for check in. WIFI is only in the common area and the garden. We choose not to put it in the dorm so you can relax without someone Skyping or watching movie next to you. Me and my friend had a perfect stay in winter time! Staff is very friendly and sincere. Close to the centre and ski areas. Definitely recommend this hostel! One of the best hostels I stayed into. All of the staff speak English, so they will easily help you through any question you have. The location is really good. By foot it would take you about 10 minutes to get to the old city of Annecy (the bike rental is also here) and 15 minutes to the lake. Everything is very clean and neat. There is a washing machine that you can use. There is a bar but it closes at 9:30pm. The ambiance is great. I came alone and met a lot of people. A really nice and cozy hostel! Close to the train station & the old town with the beautiful lake. The staff are all young people too so they make you feel at home from the moment you arrive. I am defenitly coming back here soon! Net hostel voor weinig, alleen telefonisch waren ze niet te bereiken.